During this year's challenge, my plan is to reflect on a slice of my life from that day, or the day before, and write about it. No theme to tie my writing together this year, no plans ahead of time. Just glimpses into slices of my days. Not having a plan is a very uncomfortable place for me, both as a person and a writer, so fingers crossed as today begins our journey together for the next 31 days!! Today, two college friends and I had lunch at this wonderful restaurant. As our conversation meandered over a wide variety of topics, and delicious food was partaken, I found myself smiling inside. The smile was definitely about the joy of being with these lovely ladies, but it was more than that. After 36+ years of quick lunches, I now have the luxury of having lunches that last more than an hour. Today's lunch ran a solid two hours. I was at a lunch yesterday with fellow retired teachers that was over two hours long. Two weeks ago, my cousins and I had a FOUR hour lunch. Reflecting on the duration of these lunches produced my smile. I miss many things about being in a community of adult and student learners, but I am most definitely not missing the structured lunch time! I am blessed to be at a place in my life to savor so much: the food at these lunches, the company and conversation, and the time available to me. Thanks for stopping by, and happy slicing to you! My goal is to stop by at least 5 blogs a day to read your slices, and leave comments for you. So glad you are slicing this year! I definitely don't miss quick lunches and tight schedules. Retirement is wonderful. It's great to spend time with friends having good food, great conversations and time to spare. I, too, am a retired teacher enjoying the luxury of determining how to spend my days (well, most of my days...). I can tell you have some very good friends who enjoy your company. What a privilege. I shall think of your glorious lunches as I woof my lunch down in 20 minutes tomorrow. Congratulations on earning the right to take your time over a meal and share it with good friends or just yourself. 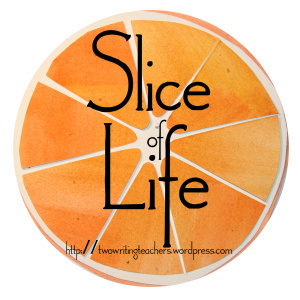 Happy slicing! I'm so happy to read your reflection and enjoyment over something so simple as a lunch and the flexibility in your days. Enjoy! I share your love of a leisurely lunch, especially after all those hurried ones during our teaching years. Sounds like you have some good friends to share those times with Such a gift! Sounds amazing ... sounds like I need to visit Dublin!!! I joked with one of you... was it you... that my celebration for this month should be flying to see you all (and making Tammy come too) It just might happen. Dublin in the spring --crazy!!! I am so glad that you are enjoying life, Karen. Retirement does have its perks. Karen, I've enjoyed watching your retirement adventures. This post makes me jealous. I savor leisurely lunches in the summer. I have no idea what they feel like in February or March! Interesting to see how many slicers are retired and enjoying long lunches. I still have to remind myself that I can slow down my eating - years of quick lunches were no funl. I love the idea of a long lunch. How delightful! On another note, I love your writing without a plan. Like you, I'm just trying to find the story in a day. It's a bit worrisome, but so far so good. Happy writing!